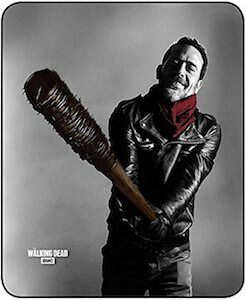 Now there is a great looking Negan And Lucille Blanket that is just perfect for all The Walking Dead fans. This The Walking Dead blanket is made from fleece and measures 45 x 60 inches. On this throw blanket you can see an amazing image of Negan with a big smile on his face and his famous Lucille baseball bat in his hand just ready to hit someone with. Now you can be cozy and warm under this blanket when you are going to watch the next episode of The Walking Dead. If you like Negan and need a comfy blanket then this is what you really want.